This week, I'm having a bit of a cold so sewing is slow and there's no way I'm modeling slips. But I'm very glad they're here and I'm considering fabric options for these wonderful designs. 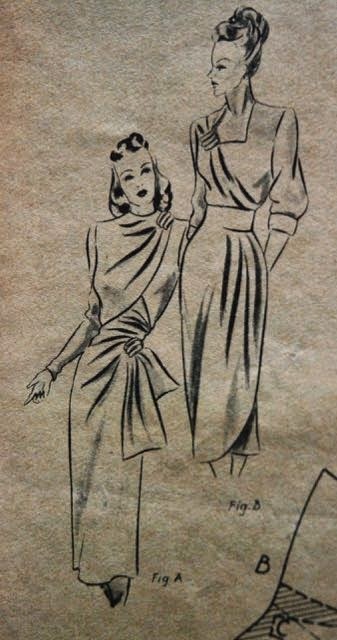 Both seem to want crepe or rayon... Not the most plentiful things in my stash (I guess that is a reason in itself to keep coming back to 1950's: Those styles sew up well in cheap fabrics like cotton). 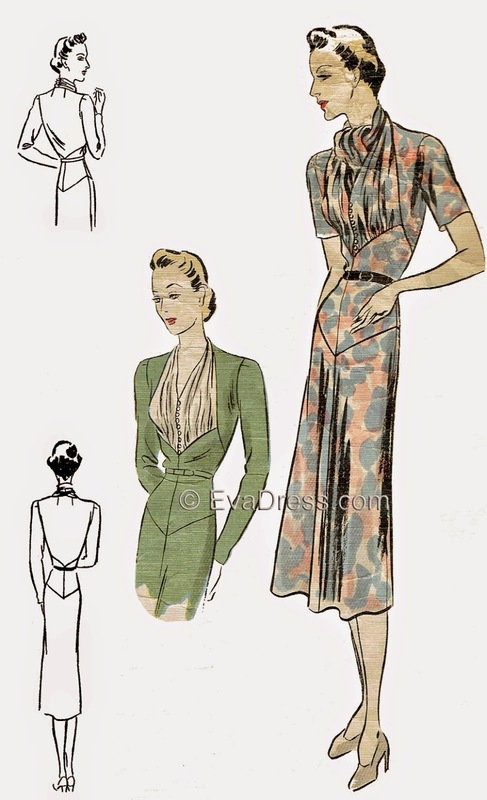 I am definitely planning to sew these up as part of this year's Vintage Sewing Pattern Pledge! These were advertised with rather limited information. All that was told was that they were bound copies of ladies' fashion magazines from 1948 and 1949. Knowing that there were no real Dutch fashion magazines in those days, I emailed the seller to inquire. The answer really pleased me: This was a magazine targeted at sewing teachers and professional seamstresses! 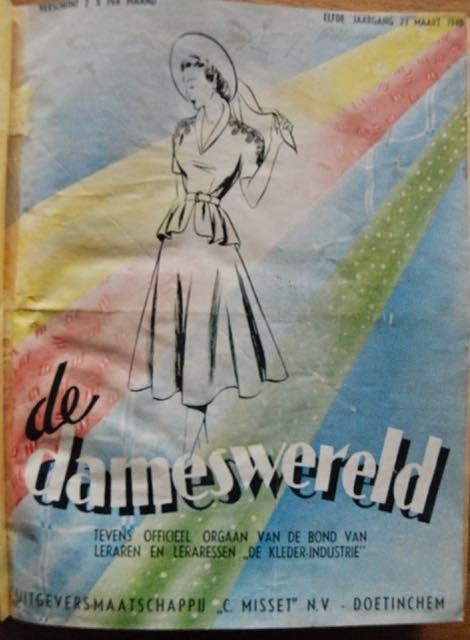 It's called de Dameswereld (which translates as "the Ladies' World") and it was also the official magazine for the association of sewing teachers. A complicated pattern explained in each issue. I love both these dresses! Hard-core sewing and tailoring instruction. 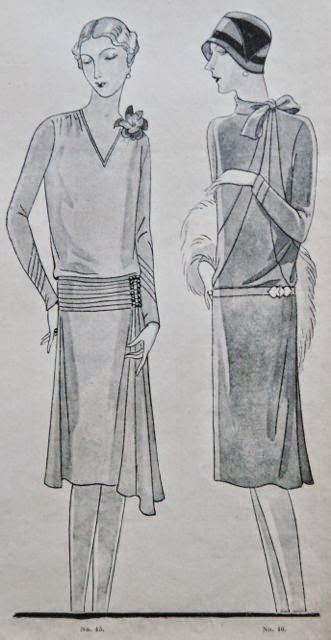 This page is about ladies' collars. Fashion news. 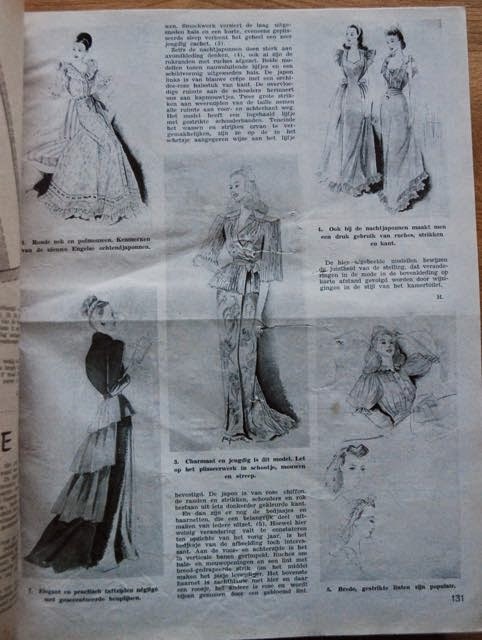 This pages highlights robes and nightgowns (described as lingerie) presented at a trade show in London. 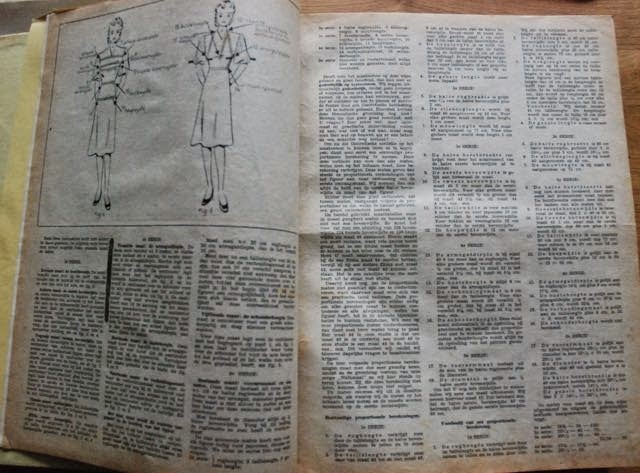 And there is information about things like fashion shows and the exact rules of the textile rationing system (in place in the Netherlands, like in the UK, until 1950). And some industry-related advertising for fabric, thread and sewing machines. You know I draft most of the patterns for just about anything I make. 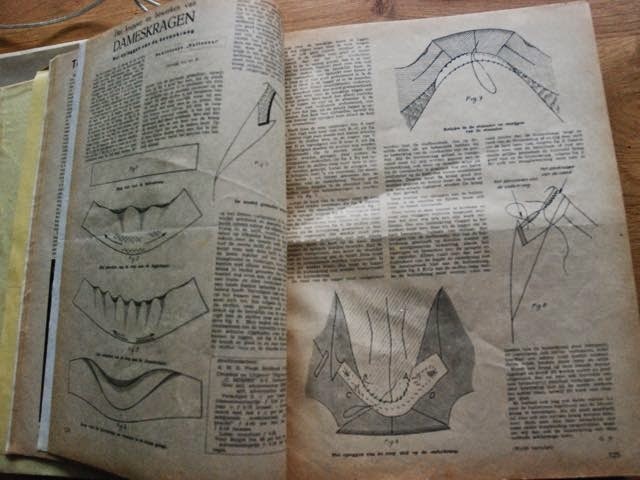 And you know I'm fond of special pattern making tricks, like those in the Pattern Magic books. And of 'object' garments (like this Burdastyle cardigan, these retro designs from Studio Faro and several of my own creations, some of which I made tutorials for which are in the list on the right of this page). Well, I often combine all those likes and loves and experiment. Especially if I have just found a lot of appropriate fabric, cheaply. In this case, I was already eyeing up the tweed-y knit I used for E's cardigan. I could make something like a knitted 1950's suit from that stuff. Or a dress. 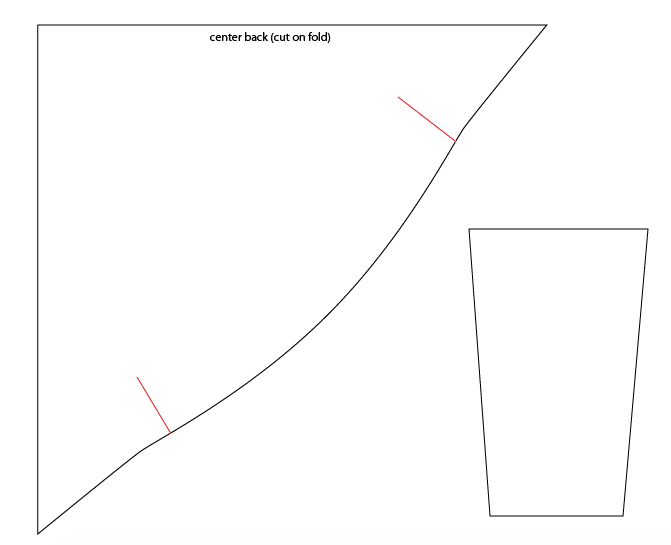 I've always loved the neckline/collar thing you get in Pattern Magic's "Wearing a square" and in the those 'object' retro tops... What if I tried to combine that with normal pattern making for jersey fabrics? 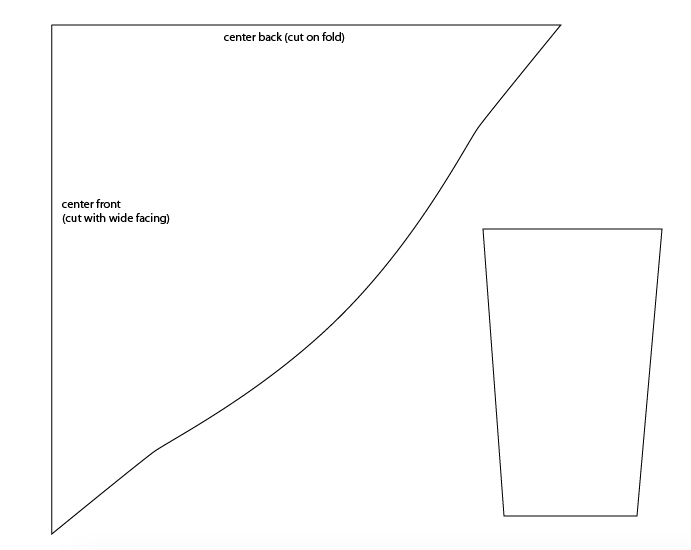 I had considered a design like this before but at that time, I didn't want to risk it because I couldn't figure out how to make sure it wouldn't be too confining for arm movement. This time, I decided to just go for it and worry about practicality later. 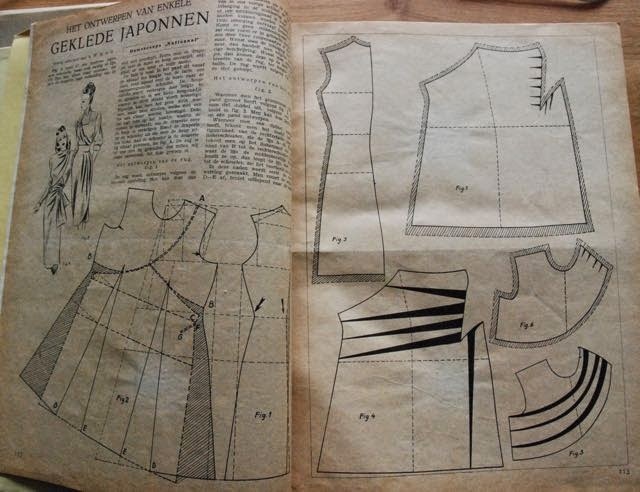 These are the bodice pattern pieces (none of these drawings are to scale). And this is the dress. It came out looking (even) more 1950's than I had expected. Not that I'm complaining though. These are not the prettiest pictures. 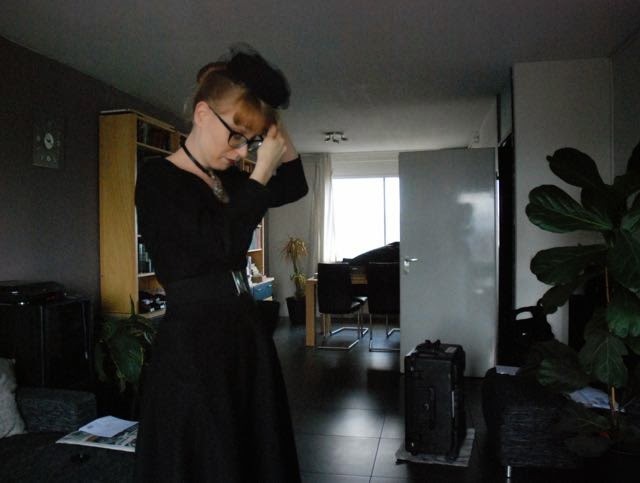 Most days are pretty glum and cloudy these past weeks and I had been wearing the dress for more than a day before it was light enough for photographs (that and the high heels are why the back looks so folded). 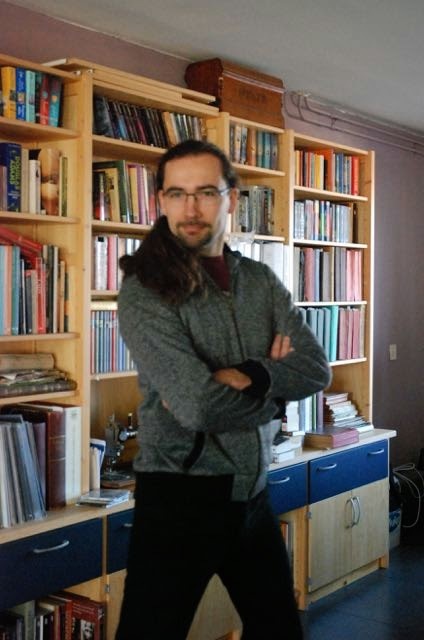 However, they're good enough to do what I really needed from them: Just show the dress. And of course, arm room is an issue. This is as far as it will go without seriously pulling the whole dress up. It doesn't make the dress completely unwearable but it leaves considerable room for improvement. There are several options for change, depending on where I want to go with the design. - It would be possible to cut an armscye in the one-piece bodice and use a more normal sleeve. In that case, it would make sense to also adapt the bodice under the sleeve and make it more of a normal bodice and less of an object there. 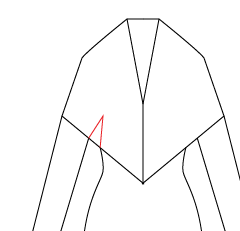 I've drawn this particular sleeve with a point because I think that would work well with the shape of the collar. All this would make the whole look more 1950's and less Japanese. 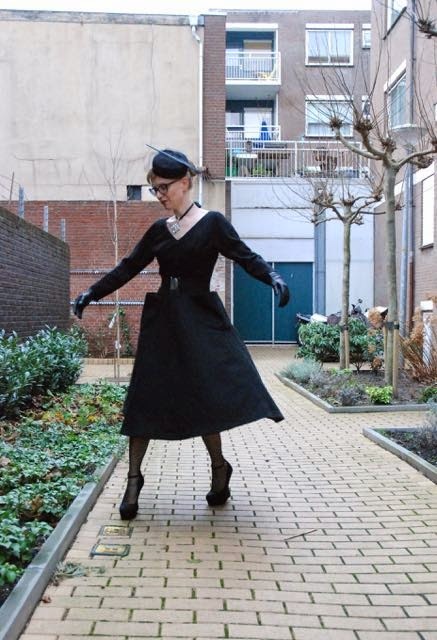 - Another option would be to make the 'object' bodice larger on all sides and mount it over a fitted lining of a thinner fabric (lycra, for example). 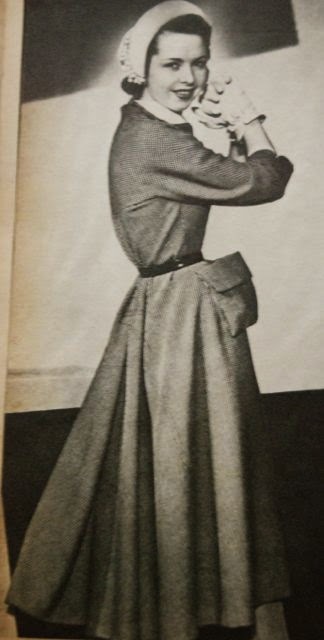 In that way it would blouse over the sleeves and skirt which should allow for a wider range of movement. This would emphasize the free-form look. - Related to the previous option, I could also treat the entire 'object' bodice as a capelet instead of a bodice. Again, over a thin and smooth lining, probably connected at the shoulders. 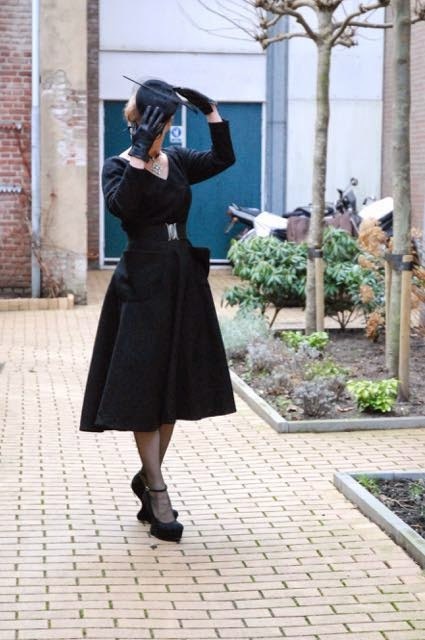 Depending on the proportions and the styling of the skirt, this could look either Pattern Magic-esk or almost 1930's. - Going back to the basic shape the dress has now, the least invasive thing to do to it would be to insert underarm gussets. This would work and it would still look fairly 1950's. I just really don't like the mess of seams you'd get at the sides. 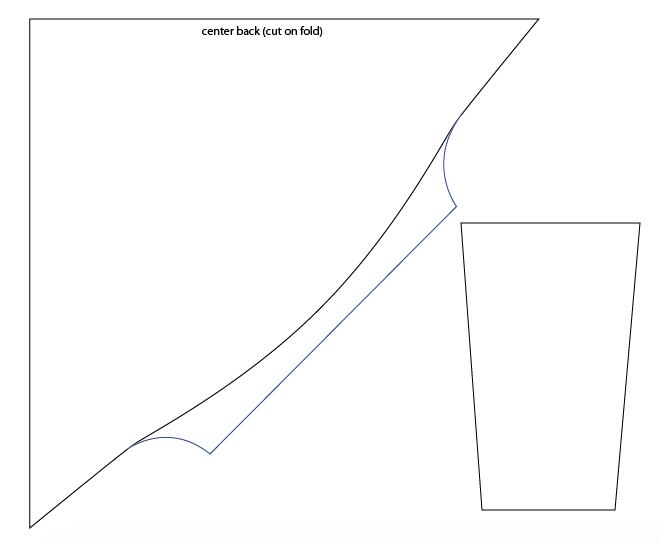 - Of course, with this shape of the bodice, the arm-room issue could also be solved by adding room at the top of the arm and shifting the sleeve up. 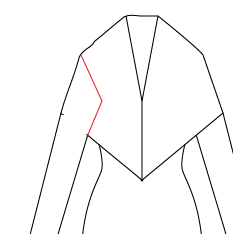 That would mean making a shoulder seam and flaring it up from the shoulder point (the long red line in the picture would be the seam, the small wedge would have to be added to each side, but I thought adding two might make the drawing more confusing). 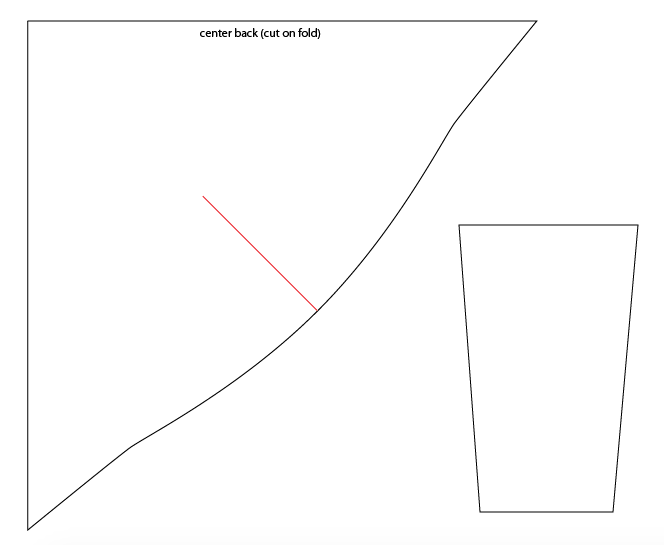 It would work but these seams would meet in a single point at the back of the neck. Which doesn't work with the cut-on facing I've been using and I don't really like that look anyway. - Building on the idea of adding room at the top of the arm, I could consider adding a gusset there. - And because that would mean attaching the sleeve to the area where the gusset is, wouldn't it be better to integrate those two? - And because the sleeve is closely fitted, it might be better to shape both pieces so they can be made to properly encircle the arm. I had some other ideas somewhere along the line, like one involving a side panel for the the bodice which would extend into the underarm gusset, but I think these were the main ones. I think I like the first and last idea best, depending on how vintage or modern I want the end result to look. 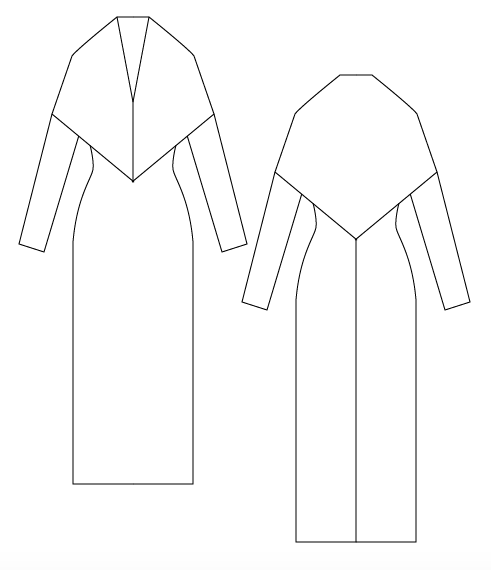 Oh, and there is one other, important alteration which I am considering for those styles which should not look very 1950's: In the design sketch, the diamond shape of the 'object' bodice is much more pronounced than in the actual dress. I would like to be able to make my creation look like that. It doesn't because I've mixed pattern shapes for loose, free-hanging shapes with pieces of a fitted design. 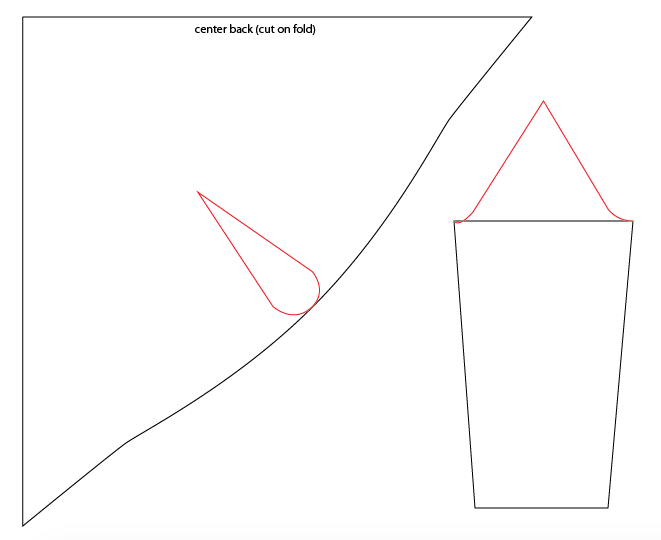 If I want the dress to look like the drawing, I should make an alteration like this, which will add extra material to follow the skirt to my sides. 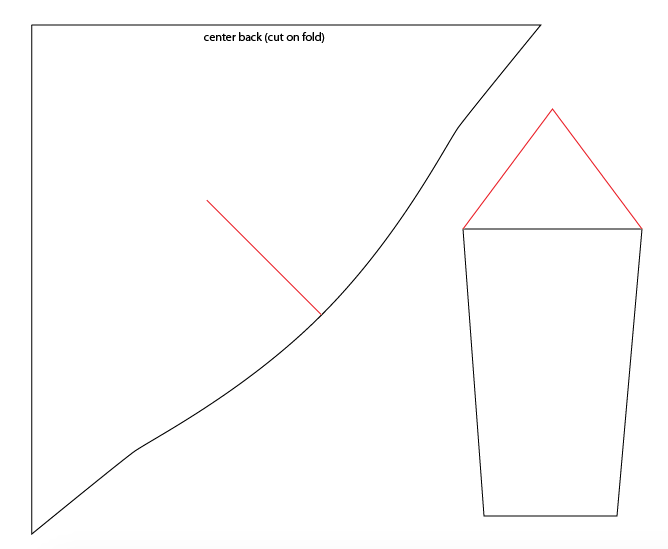 And of course, any alteration I make to the shoulder (apart from those where I also want to change the bodice under the arm) can than be applied to this shape. I haven't made any of these alterations yet, but I'm sure I'll try my favorites. And I thought you might like this little look into how my mind works with these things. 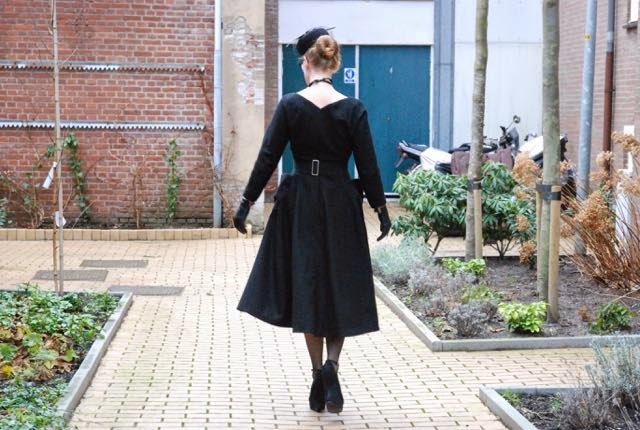 First of all: Thank you for all the nice comments on my new dress! I've been sewing these past days and I will show you some of the results later (there is another pattern-experiment and I'm finally making some slips) but I'm also thinking about the next project. 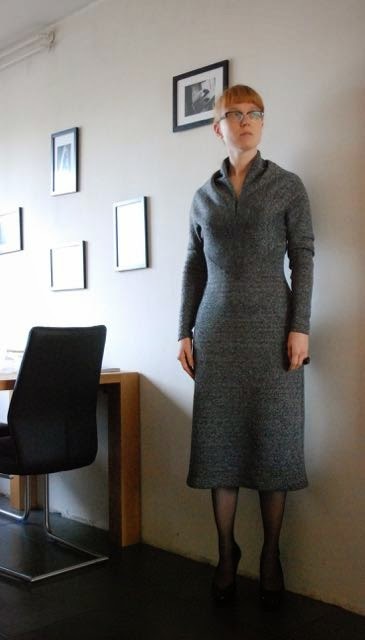 When I recently discussed the three dresses at the top of my list, all the commenters agreed, and rightly so, that the wool crepe dress should be first. After all, if I make that now, I can still wear it this year. The other two, being cotton will very likely be fine to wear well into spring. So, I agree. 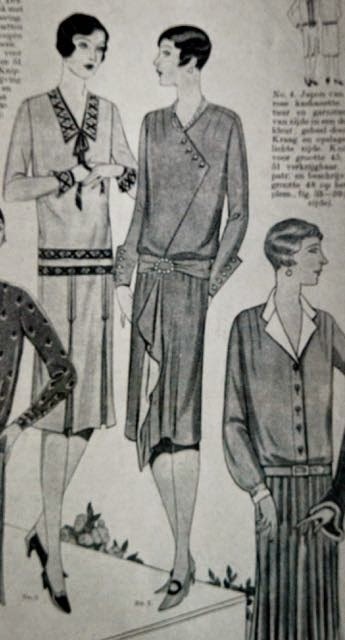 And I was looking at my 1920's magazines this week anyway (to answer a question on the new WeSewRetro Sew & Tell group on Facebook but I found so many great pictures that I've also started a 1920's Pinterest board) so I had the perfect opportunity to dig out the pattern. And then I started to doubt... First of all: This colour is rather new to me and although I think I can wear it, I don't know what kind of look it will give me. 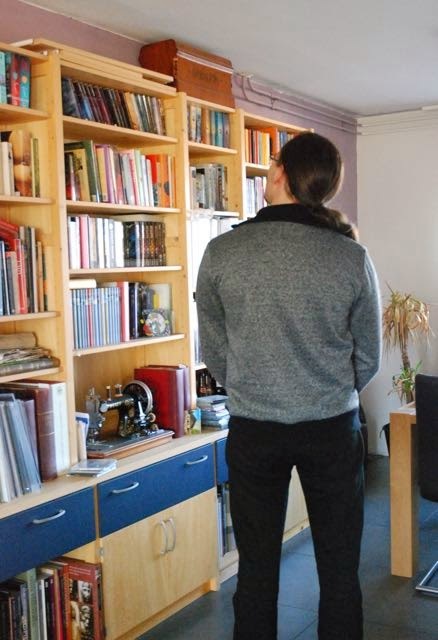 It's a useless consideration, I know, but it has become a natural reflex because I used to wear lots of black. Once I "know" a colour I'm over it. 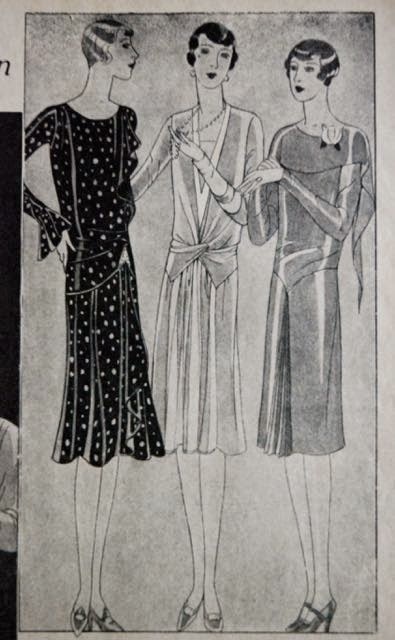 But more to the point: Is this the best (non-party) 1920's dress pattern for me and this fabric? 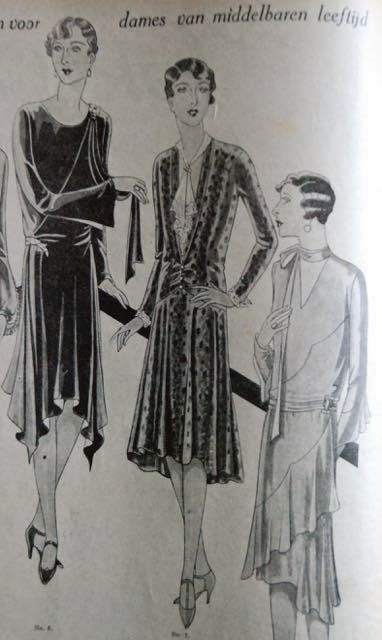 It was in my original selection when I was looking for 1920's patterns for last year's Vintage Sewing Pattern Pledge and I still think it's the best candidate from those. Although I also still like this one (but I don't have a nice contrast fabric). However, yesterday, I was going through the pages of those Gracieuse magazines again. 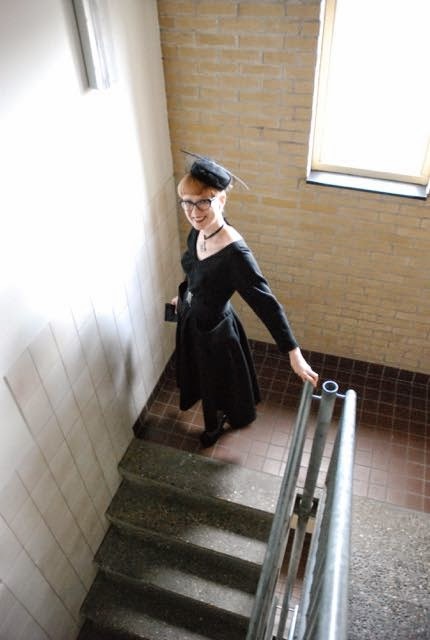 And I guess I've become a bit more used to the 1920's aesthetic. And I found more options although they may not all be possible because of the limited amount of fabric available. The one here in the middle: Slim skirt with single drape at center front, bloused top with nice button details. Again the one in the middle, it sort of looks like a dress and an unstructured jacket but it's all in one. Although this one might look very frumpy, very easily. and the one on the right. Interestingly, these are presented as designs for middle aged ladies. And then, there are these... 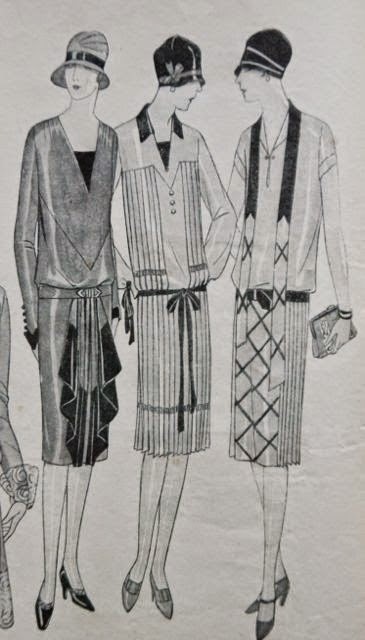 If the pattern for the dress in the middle were included, I wouldn't be writing this. I love the look of that dress! 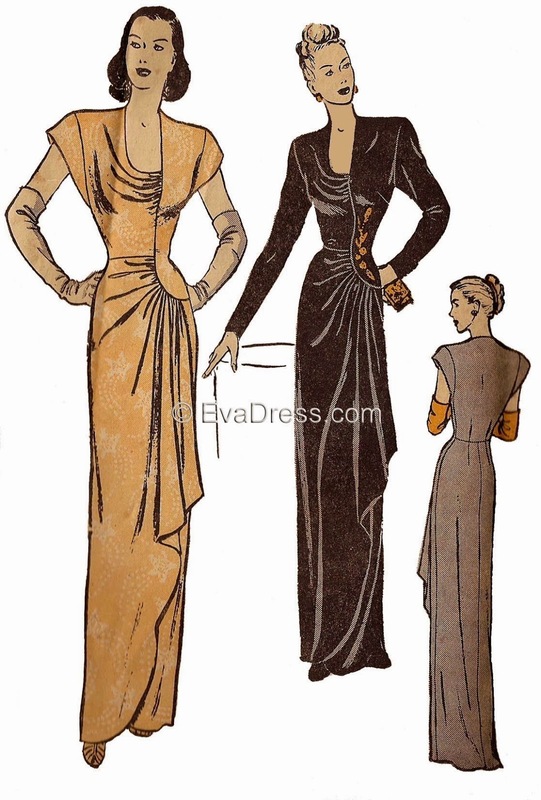 When I get to grips with the late 1920's shape and fit, I'll draft a pattern for something like it myself. 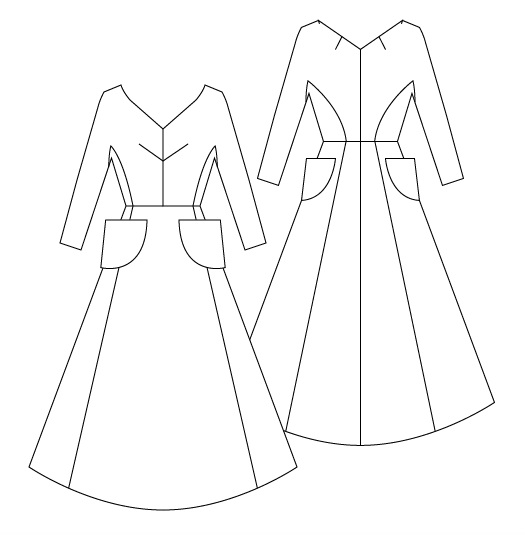 Right now, I am still looking for a pattern and the dresses at left and right are candidates. The way I've shown the dresses here, they are also in chronological order. 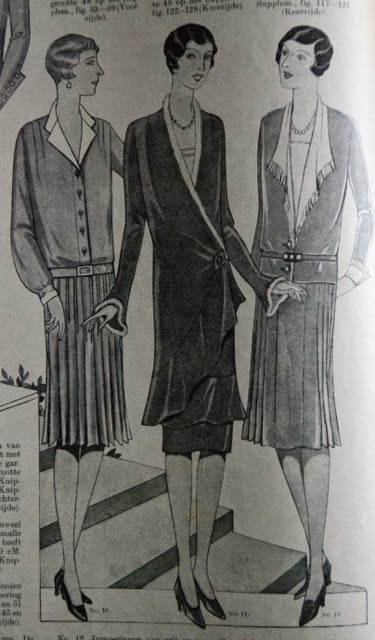 I think they are all from 1927 and 1928 but you can see the start of a subtle shift towards more skirt and a natural position for the waistline. Well, I'm still thinking about it and I'm open to suggestions. A nice surprise today: E got home so early that we had time to take pictures! 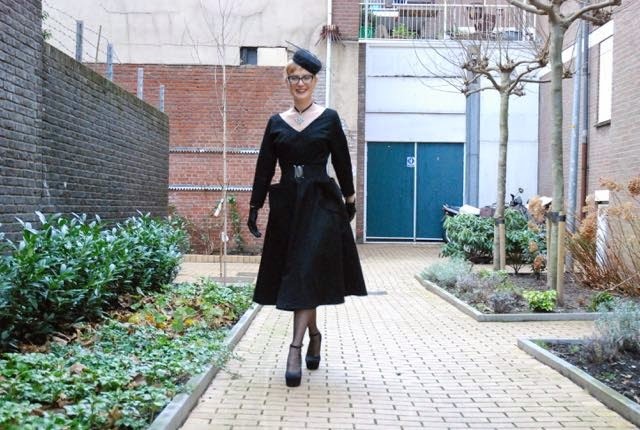 As I've mentioned before, I made this dress, after serious consideration of patterns, from a lovely black wool crepe which has been in my stash for a while (I bought it when the best of our local fabric stores, Toetenel, was having its closing-down sale). The bodice is lined with thin and soft black cotton, the skirt with regular lining material. I ended up not using the blue silk because I didn't have enough of it. And the end, that may be for the best. You would hardly have seen it under this skirt. This is what the technical drawing looks like. As usual, I drafted this pattern myself. I don't have particular sources of inspiration to show for it. 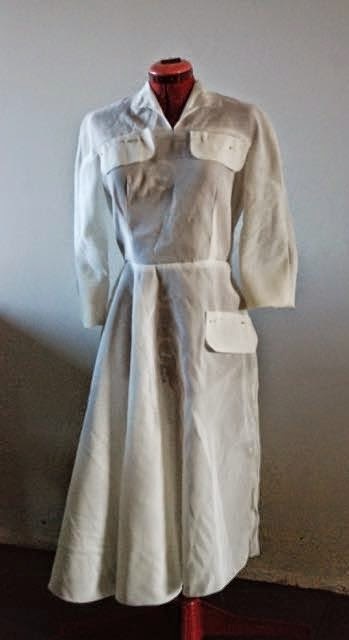 This is just how my mind combines my love for a ±1950 silhouette with my obsession for clean shapes and visible 'bones' of the pattern (seams and darts) and my enduring addiction to interesting pockets. What you can't see in the drawing is that there are no side seams. Just side panels which extend into the underarm gussets. Works well. 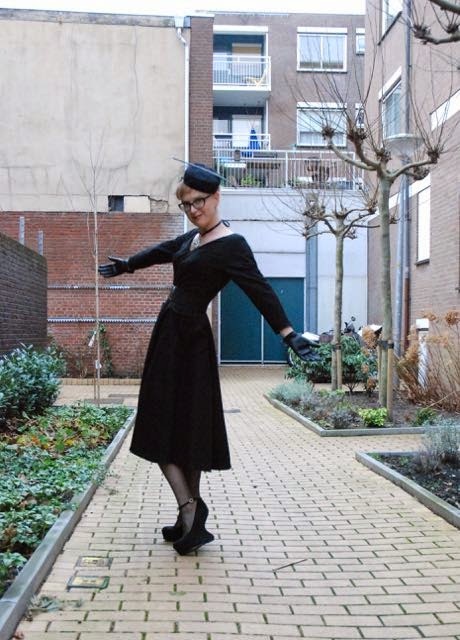 The skirt is a half circle which I made slightly longer at the back (I do that sometimes. Not on pencil-skirts, of course). When I first tried it on, I wasn't sure about this dress. I feared it might end up looking just a bit frumpy. But that was before I added these pockets. 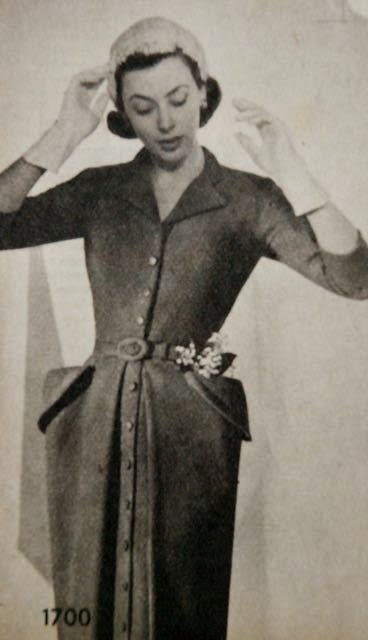 I love a stick-out pocket, and I've found plenty of examples from 1940's and 1950's fashion which prove I'm not alone in that. So there you have it... This dress is quite chique but still very comfortable. And nice and warm too. Because I've learned to be afraid of bias-issues with full skirts (some even stretch out again after the first time the garment was washed), I decided to finish E's cardigan first. I had time to go to the market on Friday morning and luckily, the market stall I usually go to for notion had exactly the kind of zipper I wanted. Which was basically the same as the one I already had, separating zipper, black tape, 'blackened' brass teeth, just 10 cm longer. And the new one even has a more fancy pull. So, now I could finish the cardigan: Inserting the zipper, applying the rest of the bottom band and hand-stitching the facing in place. I was pleased with the outcome, but of course, I didn't really know anything until E had tried it on. 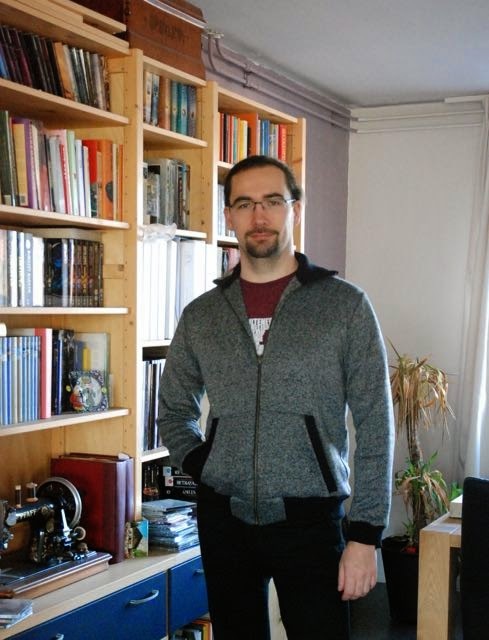 I made this thing based on the standard knit sloper from Winifred Aldrich's Metric Pattern Cutting for Menswear. 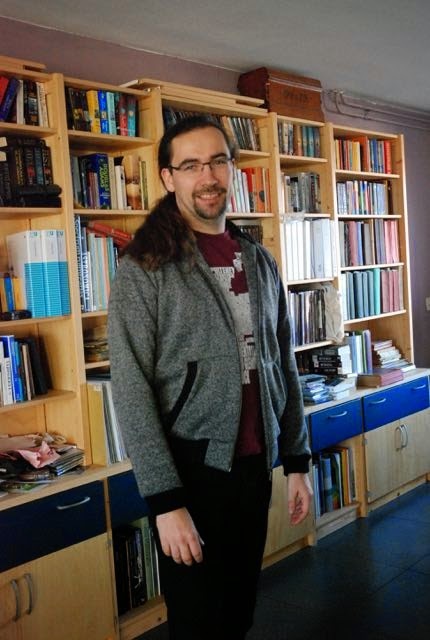 I made that for him a while ago and both the t-shirt I made from it were a bit on the wide side (although in one case, the fabric was very thin and had little recovery and the other case included a failed attempt at raglan sleeves. Don't ask me why, because I can make those properly). Which was why I thought it might work well for a cardigan. 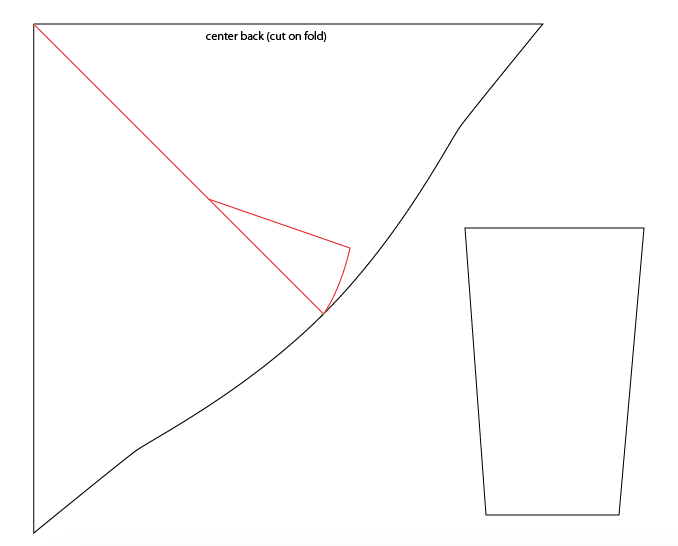 I just made a long sleeve pattern piece and cut the front in two halves with seam allowance at center front, rather than on the fold. I kept sleeves and body a little bit shorter to allow for the bands (I cut 4 cm off the body pieces and added a 7 cm band) but because this fabric has no vertical stretch whatsoever, both could have done with a bit more length. Fortunately, the cardigan is still quite wearable. I used rib knit for the collar, cuffs, bottom band and pocket edges. This is the synthetic stuff that is used most for this purpose and it's interesting. Very stretchy, obviously but it can be 'set' by heat and/or steam. This was quite useful for the pocket edges, which were distorting the whole fronts of the cardigan before I pressed them. For a first try at a garment like this (for him, that is), I think E's new cardigan is quite successful. He rarely gets cold so the demand for items like this in his wardrobe is very limited. I may still make him more though. 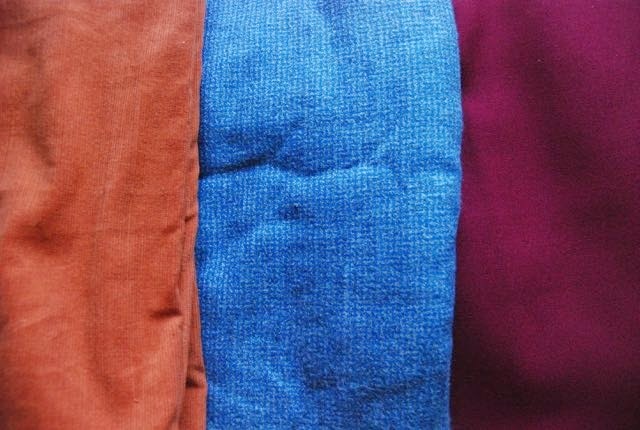 A more loosely fitted and longer one which can be worn over a shirt for example, or a sweater using the same basic shape. But I want to see him really wear this thing first.